Run Rocklin, an event that annually inspires many area law enforcement personnel to participate, will be held Sunday morning, April 7 at Johnson-Springview Park. Local law enforcement are among the thousands of runners and walkers that will once again participate in the morning trek through the Rocklin city streets at the 16th annual Run Rocklin. The Matt Redding Memorial Foundation presents Run Rocklin, a charity event that last year drew nearly 3,000 participants. This will be the 13th year that Run Rocklin has benefited the Matt Redding Foundation and also several law enforcement-related organizations. 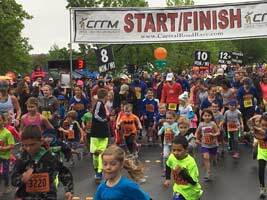 Run Rocklin raised approximately $30,000 in 2018. The Matt Redding Foundation supports education in Protective Services and provides financial support each year to graduating seniors at five local high schools, plus scholarships to Sierra College and William Jessup University. Run Rocklin has raised more than $150,000 in memory of Matt Redding, a popular Rocklin Police Officer who tragically died while on duty October 2005. He was struck and killed by a vehicle that was driven by an intoxicated driver. A well-supported local event, Run Rocklin continues to evolve, yet all prices remain the same with no increases right up to race day. And there is also no additional service charge fee. The family-friendly run has also become a wonderful event for local schools and nonprofits to raise money for their programs. Nonprofits or teams that partner with a nonprofit are urged to form a team of 20 or more runners and receive a $5 donation per paid participant from Run Rocklin. That money goes right back to the nonprofit organization. The school with the most runners receives a $300, the second place team gets $200, and third place is awarded $100. The other schools and nonprofit groups with 20 or more runners benefit as well, receiving $5 per participant. Cost for adults is $35 for the 5K and12K and $55 for the half marathon. Kids 18-under pay $20 for the 5K and12K and $40 for the half marathon. Awards will be given to the top-three finishers in each age group for the 5K, 12K and half-marathon events. Prize money will be awarded to the top-three largest school teams. Medals will be awarded to all Half Marathon, 12K and 5K finishers. Kids run participants will receive a ribbon. All Run Rocklin paid participants receive a high performance T-shirt. Run Rocklin is still actively seeking sponsors. There are multiple sponsorship levels, including $150 for a 10-by-10 exhibit space on race day morning. Event supporters will benefit from their name on the Run Rocklin T-shirt and also through various event advertising, including social media and mobile phone technology. For more information about the race or to become a sponsor or volunteer, visit www.RunRocklin.com, e-mail elephant@eaward.com or call Larry Osborne at 916 997-1808.